Management practices, like those used on the no-till field shown here, can increase total soil carbon. Agriculture in California is on both sides of the climate change challenge. It is a sector that releases significant quantities of climate-warming greenhouse gases into the atmosphere. At the same time, it is vulnerable to the expected effects of climate change, including increased drought and flooding and more intense and longer heat waves. Groundwater is drawn by a pump to irrigate almonds in Fresno County. The Sustainable Groundwater Management Act (SGMA) is a revolutionary law that will have profound impacts on the state's agriculture industry, however, it also leaves out many implementation details, according to Michael Kiparsky, director of the Wheeler Water Institute at UC Berkeley. Kiparsky authored the article Unanswered questions for implementation of the Sustainable Groundwater Management Act, which was published online by California Agriculture journal. What to do with woody waste in forests? The destructive Rough, Valley and Butte fires have raised awareness of the abundant wildfire fuels in forests, leading to calls for thinning to reduce fire risk. But where should land managers put the small trees, limbs and treetops they remove? How does thinning affect forest structure, wildlife and pests? 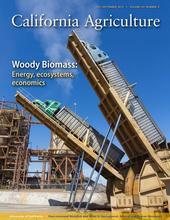 The latest edition of UC Agriculture and Natural Resources' California Agriculture journal contains a collection of peer-reviewed research articles on forest biomass energy, ecosystems and economics.